You know the food was good when you are already craving it a couple days later. 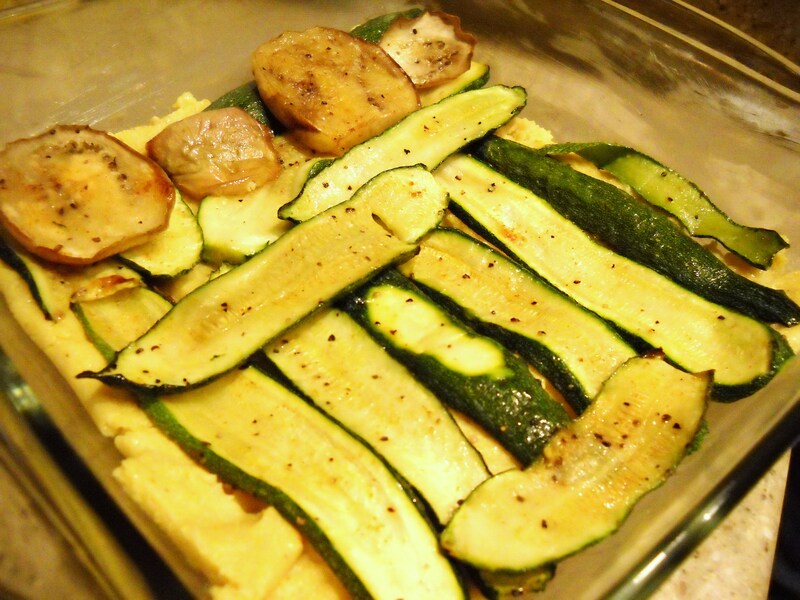 This is a roasted zucchini & eggplant and polenta layered dish, similar to lasagna but without the pasta. I think it is also called a torta. I just call it delicious! I served it along with sauteed kale and rosemary roasted potatoes(goes so good with the sauce!). You can add the kale to the “fauxsagna” itself if you like… I think I will do it next time. Be sure you like kale before you do that though… or use spinach… you know, I’m flexible. This recipe is also gluten free. Bring liquids to a boil. Add the cornmeal slowly, stirring constantly with a whisk to ensure no lumps. Turn down the heat to medium, and continue cooking, stirring often, until it pulls from the sides and tastes cooked. Immediately pour into a small greased cookie sheet and spread evenly. Leave this to cool or chill in the fridge. It should be around an inch thick. Slice zucchini and eggplant thinly. Pour a little olive oil, salt, pepper, red chili powder and mix to coat evenly. Spread on 1-2 baking pans and bake 15 mins or so. In the meantime, grease an 8×8 baking dish. Cut the polenta to fit it (at least two layers ). 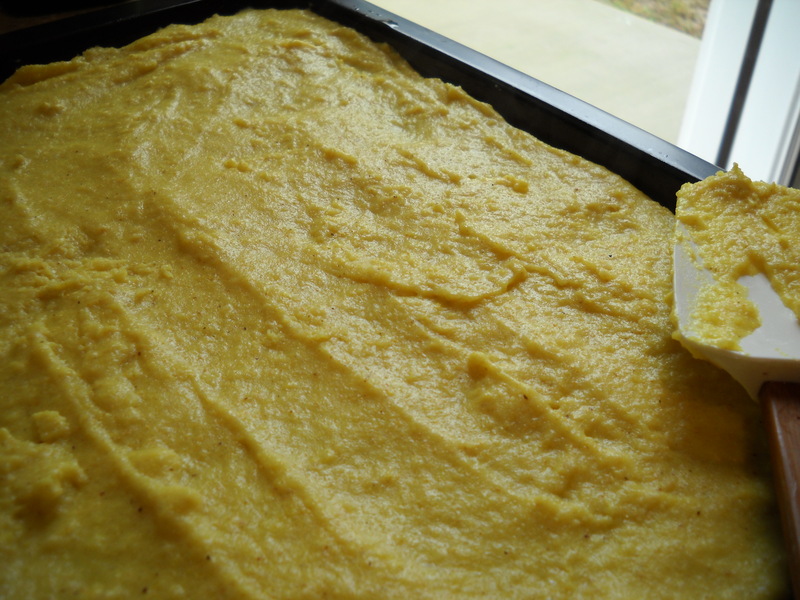 Begin with a layer of polenta; be sure to cover the bottom of the dish. Next add a layer of sauce, then a layer of veggies. At this point you can add cheese or as I did, only add cheese to the top. Repeat the layer. 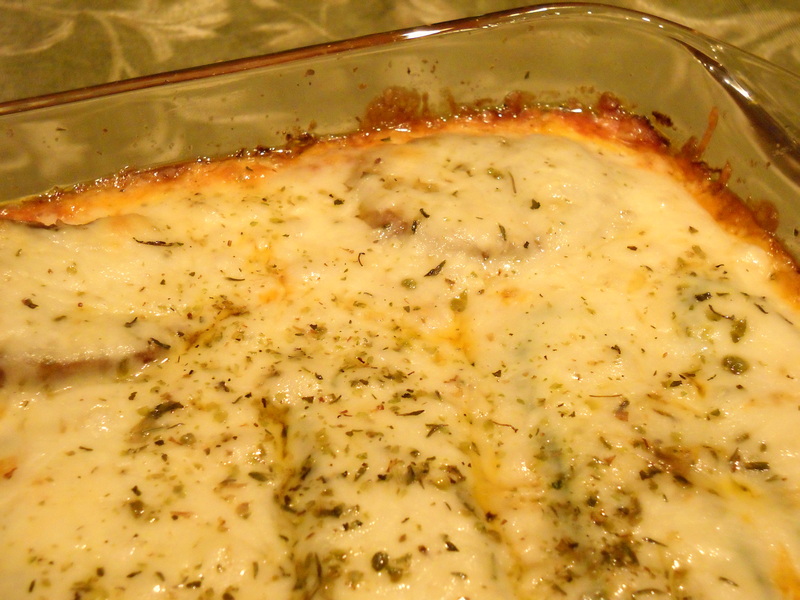 Top with cheese and sprinkle the italian herbs on. Bake for 25 mins or until bubbly and the cheese is melted and lightly browned. The polenta partially blends with the tomato sauce to make a silky texture that I loved. Can’t wait to make this again (even though the pics didn’t come out that great)! Sending this to Vegetarian Foodie Fridays! !